In the past I’ve used FSUTIL to create large test files of data to process. Unfortunately you need administrator permissions to use this utility. I decided to write a command line utility (called “Make Test File” but abbreviated to MTF.EXE) to allow non-administrators to do the same. It’s written in VB.NET so it isn’t as quick as FSUTIL, but as they say “it does the job”, and it fulfilled my immediate needs. 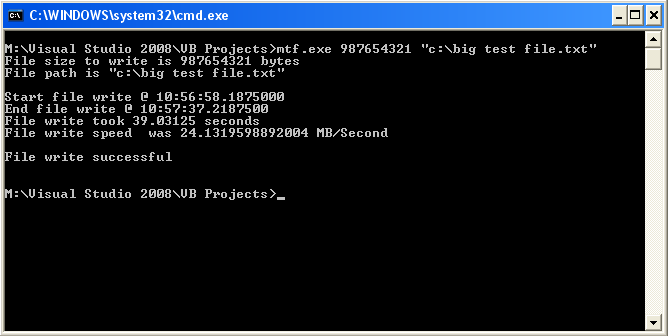 It takes two parameters – the size of the file (in bytes) and the file path to write the file to. To see an example of how to use it and the output click on the thumbnail image on the right. The resulting file just contains zeros. If there’s any demand I may look into additional features such as being able to specify what the file is filled with or creation of multiple files using some sort of incremental naming convention. On Windows XP you may find that you need to carry out some tasks as an administrator for which you would logon as an administrator (local or network/domain). If the user is already logged on then you can choose to run as administrator for many activities by selecting run as from a file’s context menu. However not every type of file has this option. My preferred method to get around this is to run a file management application as an administrator and then any file action from within that is run as an administrator. The RUNAS executable is accessible from the command line and along with the right selection of parameters should make this quite easy to do. Unfortunately a restriction around instances (and the fact that the Windows Desktop is an instance of EXPLORER.EXE) means that EXPLORER.EXE can’t be run as – at least not without changing some settings in Windows. The alternative is to use the fact that Internet Explorer is a standard component and has a synonymity with explorer. So to quickly access the C drive in explorer (via Internet Explorer) I suggest popping the following line into a shortcut and deploying it to every machine or at least a quickly accessible folder on your network (with a short name you can then quickly type into a Run dialog). runas /user:administrator "C:\Program Files\Internet Explorer\iexplore.exe c:"
This assumes your admin account is called “administrator” (add an ‘@yourdomain’ after this for domain admin access on the appropriate domain) and Internet Explorer is installed under program files in a folder called Internet Explorer. You could similarly make this a .BAT file rather than a shortcut file (.LNK), but I think the shortcut is a slightly neater looking option. When run a command prompt window will be opened and ask for the password. Type this in and press enter/return to have Windows open your nice admin file management session. Just remember to close the window when you’ve finished … you don’t want to leave end users with admin access. Sometimes when testing network connectivity to a server on the local LAN or a web site I use the ubiquitous PING to do the job. If I need to do it repeatedly I tend to write a quick DOS batch file (a text based script with a file extension of BAT or CMD). For example this script would repeatedly ping localhost – the name used for the machine the script is being run on. A few years ago I even extended this to include a ping count but it didn’t really add much. I decided it would be more useful to have something that at least gave an indication of how many “good and bad” pings had occurred. At the same time I also found that I wasn’t always necessarily at my computer as I might be tinkering with cables and other networking gear so having some sort of audible cue as to how the pings were going. I put together the following VB Script to do just this. It hasn’t been tested extensively and I’m sure that there could be a bit more validation. When the script is run it asks for the host to ping and a time at which to stop pinging. It then opens up an Internet Explorer window that displays the information about the pinging. strDisplay = strDisplay & "<p>"
strDisplay = strDisplay & "Finish pinging @ "
strDisplay = strDisplay & "<br />"
strDisplay = strDisplay & "Currently ... "
strDisplay = strDisplay & "</p>"
strDisplay = strDisplay & "<hr>"
strDisplay = strDisplay & "<table border='0'>"
strDisplay = strDisplay & "<tr>"
strDisplay = strDisplay & "<td><font color='green'>Successful pings</font></td>"
strDisplay = strDisplay & "<td><font color='green'>"
strDisplay = strDisplay & "</font></td>"
strDisplay = strDisplay & "</tr>"
strDisplay = strDisplay & "<td><font color='red'>Unsuccessful pings</font></td>"
strDisplay = strDisplay & "<td><font color='red'>"
strDisplay = strDisplay & "</table>"
strDisplay = strDisplay & "Auto Close Enabled: "
strCommand = "cmd /c echo"
There are also a few options in the script to specify numbers of beeps for successful and unsuccessful pings as well as auto closing of the Internet Explorer window and lengths of pauses between pings and before auto closing the window.